Good morning. I receive your visit today with much joy and, in giving you my most cordial welcome, I also wish to express to you my affection for all the children of the beloved Salvadoran nation. 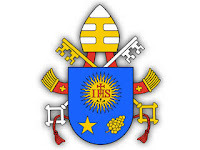 I thank Bishop Jose Luis Escobar, President of the Episcopal Conference, for his kind words. I thank all of you very much for your warm and enthusiastic presence. Joy has brought you to Rome in recognition of the beatification of Archbishop Óscar Arnulfo Romero, a good shepherd, full of love of God and close to his brothers, and who, living the dynamism of the Beatitudes, went so far as to give his life, in a violent way, while celebrating the Eucharist, the Sacrifice of Supreme Love, sealing with his own blood the Gospel he proclaimed. From the beginning of the life of the Church, we Christians, persuaded by the words of Christ, who reminds us that “unless a grain of wheat falls into the earth and dies, it remains alone” (Jn 12:24), have always maintained the conviction that the blood of martyrs is the seed of Christians, as Tertullian said. The blood of a great number of Christians that still today continues to be shed dramatically in the battlefield of the world, with the certain hope that it will bear fruit in an abundant harvest of holiness, of justice, reconciliation and love of God. But let us remember that one is not born a martyr. It is a grace that the Lord grants, and which concerns in a certain way all baptized people. Archbishop Romero recalled: “We must be ready to die for our faith, even if the Lord does not grant us this honour.... Giving one’s life does not only mean being killed; giving one’s life, having the spirit of a martyr, it is in giving in duty, in silence, in prayer, in honest fulfillment of his duty; in that silence of daily life; giving one’s life little by little” (General Audience, 7 January 2015). A martyr, in fact, is not one who remains relegated to the past, a lovely image that adorns our churches and that we remember with a certain nostalgia. No, a martyr is a brother, a sister, who continues to accompany us in the mystery of the communion of saints and who, united to Christ, is not indifferent to our earthly pilgrimage, to our suffering, to our pain. In the recent history of this beloved country, Archbishop Romero’s witness has been added to that of other brothers and sisters, such as Fr Rutilio Grande, who, not fearing to lose their life, have won it and have been constituted intercessors of their people before the Living God, who lives forever and ever, and who has in his hands the keys of death and Hades (cf. Rev 1:18). All these brothers and sisters are a treasure and a founded hope for the Church and for Salvadoran society. The impact of their gift of self is still perceived in our day. By the grace of the Holy Spirit, they were configured with Christ, like so many witnesses of the faith of all times. Dear Salvadoran friends, with only a few weeks before the beginning of the Extraordinary Jubilee of Mercy, Archbishop Romero’s example constitutes for his beloved nation an incentive and a renewed endeavour of proclaiming the Gospel of Jesus Christ, announcing it in such a way that all people will know it, so that the merciful love of the Divine Saviour may invade the heart and history of its good people. The holy People of God, pilgrimaging in El Salvador, still has ahead of it a series of difficult tasks; it continues to need, as the rest of the world, the evangelizing proclamation that will enable it to witness, in the communion of the one Church of Christ, a genuine Christian life, and that will help it to foster the promotion and development of a nation that seeks true justice, genuine peace and the reconciliation of hearts. On this occasion, with so much affection for each one of you present here and for all Salvadorans, I make my own the sentiments of Bl. Archbishop Romero, who, with well-founded hope, longed to see the arrival of the happy moment in which the terrible tragedy of the suffering of so many of our brothers and sisters because of hatred, violence and injustice, would disappear from El Salvador. May the Lord, with a shower of mercy and kindness, and with a torrent of graces, convert all hearts and may the beautiful homeland that he has given you, which bears the name of the Divine Saviour, become a country where all feel redeemed and as brothers, without distinction, because we are all one in Christ our Lord (cf. Archbishop Óscar Romero, Homily in Aguilares, 19 June 1977). I would also like to add something that perhaps has escaped us. Archbishop Romero’s martyrdom did not occur precisely at the moment of his death; it was a martyrdom of witness, of previous suffering, of previous persecution, until his death. But also afterwards because, after he died — I was a young priest and I witnessed this — he was defamed, slandered, soiled, that is, his martyrdom continued even by his brothers in the priesthood and in the episcopate. I am not speaking from hearsay; I heard those things. In other words, it is nice to see him like this: as a man who continues to be a martyr. I think that now they would no longer say such things. However, after giving his life, he continued to give it, allowing himself to be scourged by all of that misunderstanding and slander. This gives me strength, God only knows. Only God knows the history of people and how many times people who have already given their life, or who have died, continue to be scourged with the hardest stone that exists in the world: the tongue. Through the intercession of Our Lady of Peace, whose feast we celebrated a few days ago, I invoke God’s blessing upon you and all the dear sons and daughters of this blessed land. Desde los inicios de la vida de la Iglesia, los cristianos, persuadidos por las palabras de Cristo, que nos recuerda que «si el grano de trigo no cae en tierra y muere, queda infecundo» (Jn 12,24), hemos tenido siempre la convicción de que la sangre de los mártires es semilla de cristianos, como dice Tertuliano. Sangre de un gran número de cristianos mártires que también hoy, de manera dramática, sigue siendo derramada en el campo del mundo, con la esperanza cierta que fructificará en una cosecha abundante de santidad, de justicia, reconciliación y amor de Dios. Pero recordemos que mártir no se nace. Es una gracia que el Señor concede, y que concierne en cierto modo a todos los bautizados. El Arzobispo Romero recordaba: «Debemos estar dispuestos a morir por nuestra fe, incluso si el Señor no nos concede este honor... Dar la vida no significa sólo ser asesinados; dar la vida, tener el espíritu de martirio, es entregarla en el deber, en el silencio, en la oración, en el cumplimiento honesto del deber; en ese silencio de la vida cotidiana; dar la vida poco a poco» (Audiencia General, 7 enero 2015). El mártir, en efecto, no es alguien que quedó relegado en el pasado, una bonita imagen que engalana nuestros templos y que recordamos con cierta nostalgia. No, el mártir es un hermano, una hermana, que continúa acompañándonos en el misterio de la comunión de los santos, y que, unido a Cristo, no se desentiende de nuestro peregrinar terreno, de nuestros sufrimientos, de nuestras angustias. En la historia reciente de ese querido país, al testimonio de Mons. Romero, se ha sumado el de otros hermanos y hermanas, como el padre Rutilio Grande, que, no temiendo perder su vida, la han ganado, y han sido constituidos intercesores de su pueblo ante el Dios Viviente, que vive por los siglos de los siglos, y tiene en sus manos las llaves de la muerte y del abismo (cf. Ap 1,18). Todos estos hermanos son un tesoro y una fundada esperanza para la Iglesia y para la sociedad salvadoreña. El impacto de su entrega se percibe todavía en nuestros días. Por la gracia del Espíritu Santo, fueron configurados con Cristo, como tantos testigos de la fe de todos los tiempos. Cari Fratelli nell’Episcopato, Autorità, Sacerdoti, religiosi, religiose, seminaristi, fratelli e sorelle. Buongiorno. Con molta gioia ricevo oggi la vostra visita e, nel darvi il mio più cordiale benvenuto, desidero manifestarvi anche il mio affetto per tutti i figli dell’amata nazione salvadoregna. Ringrazio monsignor José Luis Escobar, Presidente della Conferenza Episcopale, per le sue cordiali parole. A tutti voi, grazie mille per la vostra presenza calorosa ed entusiasta. Vi ha portato a Roma la gioia per il riconoscimento come beato di Monsignor Óscar Arnulfo Romero, Pastore buono, pieno di amore di Dio e vicino ai suoi fratelli che, vivendo il dinamismo delle beatitudini, giunse fino al dono della sua stessa vita, in modo violento, mentre celebrava l’Eucaristia, Sacrificio dell’amore supremo, suggellando con il suo stesso sangue il Vangelo che annunciava. Fin dagli inizi della vita della Chiesa, noi cristiani, persuasi dalle parole di Cristo, che ci ricorda che «se il chicco di grano caduto in terra non muore, rimane solo» (Gv 12, 24), abbiamo nutrito sempre la convinzione che il sangue dei martiri è seme di cristiani, come dice Tertulliano. Sangue di un gran numero di cristiani martiri che ancora oggi, in modo drammatico, continua a essere sparso nel campo del mondo, con la speranza certa che fruttificherà in un raccolto abbondante di santità, di giustizia, di riconciliazione e di amore di Dio. Ma ricordiamo che martiri non si nasce. È una grazia che il Signore concede e che riguarda in qualche modo tutti i battezzati. L’Arcivescovo Romero ricordava: «Tutti dobbiamo essere disposti a morire per la nostra fede, anche se il Signore non ci concede questo onore... Dare la vita non significa solo essere uccisi; dare la vita, avere lo spirito di martirio, è dare nel dovere, nel silenzio, nella preghiera, nel compimento onesto del dovere; in quel silenzio della vita quotidiana; dare la vita a poco a poco» (Udienza generale, 7 gennaio 2015). Il martire, di fatto, non è qualcuno che è rimasto relegato nel passato, una bella immagine che adorna le nostre chiese e che ricordiamo con una certa nostalgia. No, il martire è un fratello, una sorella, che continua ad accompagnarci nel mistero della comunione dei santi, e che, unito a Cristo, non trascura il nostro pellegrinare terreno, le nostre sofferenze, le nostre pene. Nella storia recente di questo amato paese, la testimonianza di Monsignor Romero si è aggiunta a quella di altri fratelli e sorelle, come padre Rutilio Grande che, non temendo di perdere la propria vita, l’hanno guadagnata, e sono stati costituiti intercessori del loro popolo dinanzi al Dio Vivente, che vive nei secoli dei secoli, e ha nelle sue mani le chiavi della morte e degli inferi (cfr. Ap 1, 18). Tutti questi fratelli sono un tesoro e una fondata speranza per la Chiesa e per la società salvadoregna. L’impatto del loro dono di sé si percepisce ancora ai nostri giorni. Attraverso la grazia dello Spirito Santo furono configurati con Cristo, come tanti testimoni della fede di tutti i tempi. Cari amici salvadoregni, a poche settimane dall’inizio del Giubileo straordinario della Misericordia, l’esempio di Monsignor Romero costituisce per la sua amata nazione uno stimolo e una opera rinnovata della proclamazione del Vangelo di Gesù Cristo, annunciandolo in modo che lo conoscano tutte le persone, affinché l’amore misericordioso del Divino Salvatore invada il cuore e la storia della sua buona gente. Il santo popolo di Dio che peregrina in El Salvador ha ancora dinanzi a sé una serie di difficili compiti, continua ad aver bisogno, come il resto del mondo, dell’annuncio evangelizzatore che gli consenta di testimoniare, nella comunione dell’unica Chiesa di Cristo, l’autentica vita cristiana, e lo aiuti a favorire la promozione e lo sviluppo di una nazione alla ricerca della vera giustizia, dell’autentica pace e della riconciliazione dei cuori. In questa occasione, con tanto affetto per ognuno di voi qui presenti e per tutti i salvadoregni, faccio miei i sentimenti del beato Monsignor Romero, che con fondata speranza anelava veder giungere il felice momento in cui da El Salvador sarebbe scomparsa la terribile tragedia della sofferenza di tanti nostri fratelli a causa dell’odio, della violenza e dell’ingiustizia. Che il Signore, con una pioggia di misericordia e di bontà, con un torrente di grazie, converta tutti i cuori e la bella patria che vi ha dato, e che porta il nome del Divino Salvatore, si trasformi in un paese dove tutti si sentano redenti e fratelli, senza distinzioni, perché tutti siamo una cosa sola in Cristo nostro Signore (cfr. Monsignor Óscar Romero, Omelia ad Aguilares, 19 giugno 1977). Vorrei aggiungere qualcosa che forse ci è sfuggito. Il martirio di monsignor Romero non avvenne solo al momento della sua morte; fu un martirio-testimonianza, sofferenza anteriore, persecuzione anteriore, fino alla sua morte. Ma anche posteriore, perché una volta morto — io ero un giovane sacerdote e ne sono stato testimone — fu diffamato, calunniato, infangato, ossia il suo martirio continuò persino da parte dei suoi fratelli nel sacerdozio e nell’episcopato. Non parlo per sentito dire, ho ascoltato queste cose. Cioè, è bello vederlo anche così: come un uomo che continua a essere martire. Ebbene, credo che ora quasi nessuno osi più farlo. Dopo aver dato la sua vita, continuò a darla lasciandosi colpire da tutte quelle incomprensioni e calunnie. Questo mi dà forza, solo Dio lo sa. Solo Dio conosce le storie delle persone, e quante volte persone che hanno già dato la loro vita o che sono morte continuano a essere lapidate con la pietra più dura che esiste al mondo: la lingua. Per intercessione di Nostra Signora della Pace, la cui festa abbiamo celebrato qualche giorno fa, invoco la benedizione di Dio su di voi e su tutti i cari figli e figlie di questa terra benedetta. After he finished reading his prepared text, Francis said: “I would like to add something that perhaps we gloss over in the martyrdom of Archbishop Romero, which was not limited to the time of his death; it was a martyrdom that continued after his death.” Romero's martyrdom “continued even by his brothers in the priesthood and in the episcopate,” the pope said, referring to criticism of Romero inside the church. “How often people who have given their lives or who have died are still stoned with the hardest stone in the world: the tongue,” said the Pontiff. The pope had read the speech quietly, in a slight monotone and looked tired, but he livened up visibly when he spoke off-the-cuff. The audience began with a greeting from the current Archbishop of San Salvador, Msgr. José Luis Escobar Alas, who introduced the 500 participants, including “the majority of the episcopate.” Escobar said that on May 23, the pope wrote the most beautiful page in the history of the Church in El Salvador and in the history of the country itself. He expressed his feelings of joy and gratitude for having in Romero an intercessor and a model. He spoke of overcoming social injustice and social conflict due to Romero. He asked for the prompt canonization of Romero and the prompt beatification of Rutilio Grande. He “reiterated the invitation” to the pope to visit El Salvador, which would be “a great blessing” for the Salvadoran people and a great joy, while El Salvador is suffering so much violence and pain. He offered Francis “unconditional obedience.” Finally, he invoked the intercession of Romero to grace the successor of Peter and asked the Pope’s blessing for El Salvador. The Salvadoran delegation included seven bishops and, representing the government, the Foreign Minister, Hugo Martinez, and the Minister of Governance and Communications Hato Hasbún. They were also accompanied by hundreds of Salvadorans living in Italy, mostly in the northern city of Milan. 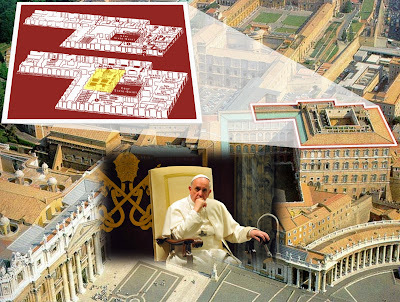 The members of the delegation began lining up to enter the Vatican premises through the Bronze Gate in St. Peter’s Square at 9:00 am for the audience which began at noon in the Sala Regia (Regal Room) of the Apostolic Palace. In his meeting with the pope, the Salvadorans bishops updated him on the status of the beatification cause of the Salvadoran Jesuit martyr Rutilio Grande. According to Msgr. Jesus Delgado Acevedo, who is close to the Romero canonization cause, “The Pope has conditioned, in a way, the canonization of Archbishop Romero” to the conclusion of the work on the cause of Grande so that he can personally beatify Grande and canonize Romero during a single trip to El Salvador. “He has told the bishops that the day they are prepared with the beatification of Father Rutilio Grande, on that occasion he would canonize Romero, provided there was a proven miracle by Archbishop Romero,” Delgado told a Salvadoran outlet before departing for Italy. 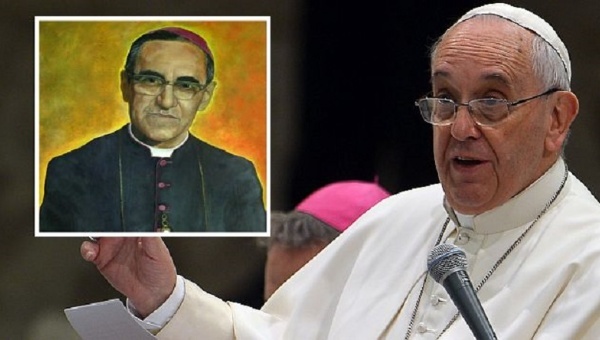 The Salvadoran Church insists that three possible miracles by Romero have been already sent to Rome, but Delgado said he was unaware if they have been presented to the pope. The Salvadoran bishops who participated in the audience included the Military Bishop Msgr. Fabio Colindres. ; and the Bishops of: Chalatenango—Msgr. Luis Morao Andreazza; San Vicente—Msgr. José Elias Rauda Gutierrez; Sonsonate—Msgr. Constantino Barrera Morales; and Zacatecoluca—Msgr. Elías Samuel Bolaños Avelar, who coordinated the composition of delegation. The above-mentioned Msgr. Delgado also attended. Before meeting with the Salvadorans, Pope Francis had separate meetings with representatives of CELAM, the Latin American Bishops’ Conference, and with Card. Gerhard Müller, Prefect of the Congregation for the Doctrine of the Faith, among others. The Apostolic Palace, site of the papal audience. Dear Brothers in the Episcopate, authorities, priests, religious, seminarians, dear brothers and sisters. With great joy I receive today your visit and in giving you the warmest welcome, I also express my affection for all the children of the beloved Salvadoran nation. I thank Archbishop José Luis Escobar, President of the Episcopal Conference, for his kind words. To all of you, thank you very much for your warm and enthusiastic presence. You come to Rome in joy recognition of Archbishop Oscar Arnulfo Romero as a Blessed; he was a Good Shepherd, filled with the love of God and close to his brothers and sisters, living the dynamism of the Beatitudes, he went as far as to giving his life in a violent manner, while celebrating the Eucharist, the supreme sacrifice of love, sealing with his blood the Gospel he was announcing. Since the beginning of the life of the Church, Christians, persuaded by the words of Christ, who reminds us that "unless a grain of wheat falls into the earth and dies, it remains alone" (Jn 12:24), we have always had the conviction that the blood of martyrs is the seed of Christians, in the words of Tertullian. The blood of many Christians martyrs that today too, dramatically, is still shed in the field of the world with the certain hope that it will bear fruit in a rich harvest of holiness, justice, reconciliation and love of God. But let us remember that one is not born a martyr. It is a grace that the Lord gives, and in a way it concerns all the baptized. Archbishop Romero recalled: "We must be willing to die for our faith, even if the Lord does not give us this honor ... Giving one's life means not only being killed; giving life, having a spirit of martyrdom, is giving in duty, in silence, in prayer, in the honest fulfillment of duty; in the silence of daily life; giving life slowly" (General Audience, January 7, 2015). The martyr, in fact, is not someone who was relegated in the past, a beautiful image that adorns our churches and we remember with nostalgia. No, the martyr is a brother, a sister, who continues to accompany us in the mystery of the communion of saints, and who, united to Christ, does not ignore our earthly pilgrimage, our sufferings, our agonies. In the recent history of this beloved country, the testimony of Msgr. Romero, has joined the other brothers and sisters, such as Father Rutilio Grande, who, not afraid of losing their life, have won it and have been made intercessors for their people before the Living One, who lives for ever and ever, and has in his hands the keys of death and the abyss (Rev 1:18). All these brothers are a treasure and grounded hope for the Salvadoran Church and for society. The impact of their surrender is still felt today. By the grace of the Holy Spirit, they were configured to Christ, as many witnesses to the faith of all time. 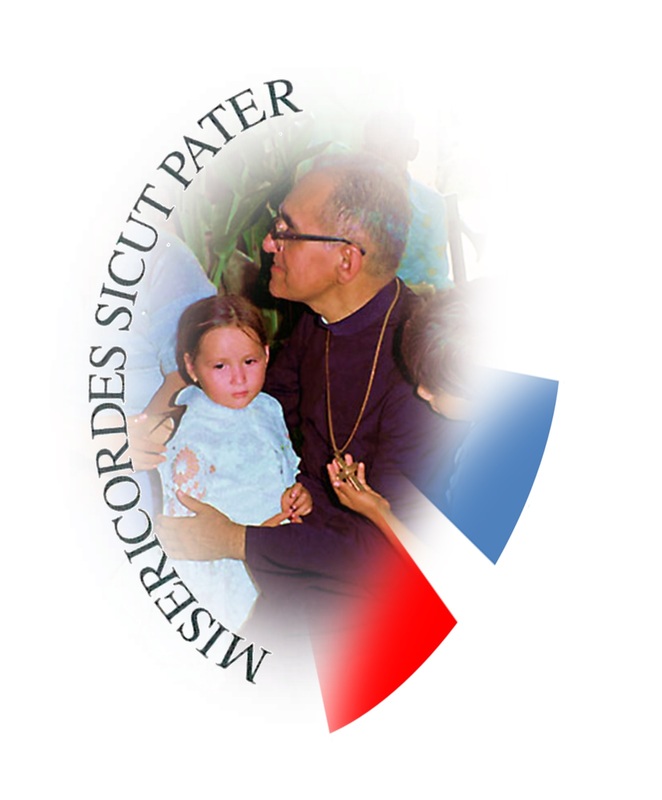 Dear Salvadoran friends, a few weeks from starting the special Jubilee of Mercy, the example of Archbishop Romero for his beloved nation is a stimulus for a renewed proclamation of the Gospel of Jesus Christ, announcing it so that all people know it, so that the merciful love of the Divine Savior invades the heart and history of His good people. The holy people of God on pilgrimage in El Salvador still face a series of difficult tasks, still need, like the rest of the world, the evangelizing announcement that allows it to witness, in the communion of the one Church of Christ, the authentic Christian life, that will help to advance the promotion and development of a nation in search of true justice, genuine peace and reconciliation of hearts. At this time, with so much affection for each of you here present and to all Salvadorans I make mine the sentiments of Blessed Archbishop Romero, who had the full hope to see the arrival of the happy time when the terrible tragedy the suffering of so many of our brothers because of hatred, violence and injustice would disappear from El Salvador. May the Lord, with a shower of mercy and goodness, with a torrent of grace, convert all hearts and the beautiful country that has given you, and bears the name of the Divine Savior, that it become a country where everyone feels redeemed and as brothers, with no difference, because we are all one in Christ our Lord (cf. Mons. Oscar Romero, homily in Aguilares, June 19, 1977). Through the intercession of Our Lady of Peace, whose feast we celebrated a few days ago, I invoke God's blessing upon you and all the beloved sons and daughters of this blessed land. Al finalizar su texto preparado, Francisco agregó: “Quisiera añadir algo también que quizás pasamos de largo sobre el martirio de Monseñor Romero que no fue puntual en el momento de su muerte fue un martirio que continuó después de su muerte”. El martirio de Romero “continuó incluso por hermanos suyos en el sacerdocio y en el episcopado”, dijo el papa, en referencia a las críticas de Romero dentro de la iglesia. “Cuantas veces las personas que ya han dado su vida o que han muerto se les sigue lapidando con la piedra más dura que existe en el mundo: la lengua”, dijo el Pontífice. El Papa había leído el discurso en voz baja, hasta monótono, se veía cansado, pero al final cuando habló libremente se volvió animado. La audiencia comenzó con un saludo del actual Arzobispo de San Salvador, Mons. José Luis Escobar Alas, que presentó a los 500 participantes, entre ellos “la mayoría de los obispos”. Escobar dijo que el 23 de mayo, el Papa escribió la página más hermosa en la historia de la Iglesia en ElSalvador y la historia del propio país. Expresó sus sentimientos de alegría y gratitud por haber dado en Romero un intercesor y un modelo. Habló de la superación de la injusticia social y el conflicto social por medio de Romero. Pidió a la pronta canonización de Romero y la pronta beatificación de Rutilio Grande. “Reiteró la invitación” al Papa a visitar El Salvador, lo que sería “una gran bendición” para el pueblo salvadoreño y una gran alegría, mientras que El Salvador sufre tanta violencia y dolor. Francisco ofreció “obediencia incondicional”. Por último, invocó la intercesión de Romero por toda gracia al sucesor de Pedro y pidió la bendición del Papa a El Salvador. “Estamos muy agradecidos con el Santo Padre, vendremos a darle gracias como comunidad salvadoreña”, dijo Mons. Gregorio Rosa Chávez, obispo auxiliar de San Salvador—uno de los integrantes de la comitiva—a Radio Vaticana. “El mundo tiene en Romero un ícono de lo que la Iglesia sueña para los pastores, un pastor que va adelante del rebaño, como dice el Papa, en medio y detrás del rebaño, un pastor que tiene olor a oveja y que da la vida por su rebaño”. Han entregado al papa una reliquia de Romero: un escapulario y un pedazo del corporal manchado con la sangre de Romero. Francisco dijo que la sangre de Romero se mezcla con la “Sangre de un gran número de cristianos mártires que también hoy, de manera dramática, sigue siendo derramada en el campo del mundo, con la esperanza cierta que fructificará en una cosecha abundante de santidad, de justicia, reconciliación y amor de Dios”. Las reacciones a los comentarios de Francisco han seguido patrones predecibles. La prensa de El Salvador informa que Francisco ha dirigido sus críticas a los obispos salvadoreños, quienes, hasta hace poco, estaban divididos sobre Romero (uno había dicho a Juan Pablo II que Romero era responsable por las muertes de la guerra civil, por supuestamente fomentar conflictos de clase al denunciar la injusticia). La Prensa Asociada (Associated Press) apareció ver los comentarios a través de las divisiones del reciente Sínodo de Obispos, informando que Francisco había “denunciado” a funcionarios clericales que se oponían a Romero. En realidad, ambos puntos de vista parecen perder la marca. Francisco no ha intentado aislar a los obispos salvadoreños, porque informó haber escuchado personalmente críticas injustas de Romero—en Argentina. También no “denunció” o criticó directamente a nadie, señalando que Romero fue objeto de ‘calumnia’ como un atributo de su martirio. “O sea que es lindo verlo también así”, dijo Francisco de Romero: “un hombre que sigue siendo mártir”. La delegación salvadoreña incluyó siete obispos, y en representación del gobierno el Canciller de la República, Hugo Martínez, y el Ministro de Gobernabilidad y Comunicaciones Hato Hásbun. También los acompañaron centenas de salvadoreños que residen en Italia, más que todo en la ciudad norteña de Milán. Los integrantes de la delegación empezaron a hacer fila para ingresar a las instalaciones Vaticanas por el Portón de Bronce de la Plaza de San Pedro a las 9:00 de la mañana para la audiencia que comenzó al mediodía en la Sala Regia del Palacio Apostólico. En sus reuniones con el Papa, los obispos salvadoreños lo actualizaron sobre el estado de la causa de beatificación del mártir Jesuita salvadoreño Rutilio Grande. Según Mons. Jesús Delgado Acevedo, cercano a la causa de canonización de Romero, “El Papa ha condicionado, en cierto modo, la canonización de Monseñor Romero” a la conclusión de trabajos en la causa de Grande para poder personalmente canonizar a Romero y beatificar a Grande durante un solo viaje a El Salvador. “Les ha dicho a los obispos que el día en que estén preparados con la beatificación del padre Rutilio Grande, lo aprovecharía para canonizar a Monseñor Romero, siempre y cuando haya mediado un milagro que haya hecho Monseñor Romero”, dijo Delgado a un medio salvadoreño antes de salir rumbo a Italia. La Iglesia Salvadoreña insiste en que tres posibles milagros de Romero han sido ya remitidos a Roma, aunque Delgado dijo desconocer si han sido presentados al papa. Los salvadoreños proponen al Papa ir a El Salvador para presidir sobre la doble ceremonia de Romero y Grande durante su próximo viaje a México, ya confirmado por el Vaticano para 2016. “Creo que, asumo, no soy profeta”, dijo Delgado, “que la visita del Papa sería el año próximo, durante su visita a México, tal vez alargue su visita a Guatemala y a El Salvador, podría ser en ese momento que el Papa visite a El Salvador y canonizaría a Monseñor Romero”. Los miembros del episcopado salvadoreño que participaron en la audiencia incluyeron el Obispo Castrense Mons. Fabio Colindres; y los Obispos de: Chalatenango—Mons. Luis Morao Andreazza; San Vicente—Mons. José Elías Rauda Gutiérrez; Sonsonate—Mons. Constantino Barrera Morales; y Zacatecoluca—Mons. Elías Samuel Bolaños Avelar, quien coordinó la composición de delegación. También asistió el arriba mencionado Mons. Delgado. Antes de reunirse con los salvadoreños, Francisco se reunió por separado con representantes del CELAM, la Conferencia Episcopal Latinoamericana, y con el cardenal Gerhard Müller, Prefecto de la Congregación para la Doctrina de la Fe, entre otros. Más allá de las curaciones presentadas para allanar el camino a la canonización de Romero, Mons. Rosa Chávez dice que los pastores salvadoreños esperan dos milagros particulares: a nivel local la reconciliación verdadera en el país y vencer la violencia y a nivel global que el beato Romero sea un ícono de lo que el Papa Francisco sueña como pastor, “una Iglesia pobre para los pobres”. El Palacio Apostólico, sitio de la Audiencia. Queridos hermanos en el Episcopado, Autoridades, Sacerdotes, religiosos, religiosas, seminaristas, Queridos hermanos y hermanas. Desde los inicios de la vida de la Iglesia, los cristianos, persuadidos por las palabras de Cristo, que nos recuerda que «si el grano de trigo no cae en tierra y muere, queda infecundo» (Jn 12,24), hemos tenido siempre la convicción de que la sangre de los mártires es semilla de cristianos, como dice Tertuliano. Sangre de un gran número de cristianos mártires que también hoy, de manera dramática, sigue siendo derramada en el campo del mundo, con la esperanza cierta que fructificará en una cosecha abundante de santidad, de justicia, reconciliación y amor de Dios. Pero recordemos que mártir no se nace. Es una gracia que el Señor concede, y que concierne en cierto modo a todos los bautizados. El Arzobispo Romero recordaba: «Debemos estar dispuestos a morir por nuestra fe, incluso si el Señor no nos concede este honor... Dar la vida no significa sólo ser asesinados; dar la vida, tener espíritu de martirio, es entregarla en el deber, en el silencio, en la oración, en el cumplimiento honesto del deber; en ese silencio de la vida cotidiana; dar la vida poco a poco» (Audiencia General, 7 enero 2015). Queridos amigos salvadoreños, a pocas semanas del inicio el Jubileo extraordinario de la Misericordia, el ejemplo de Mons. Romero constituye para su querida nación un estímulo para una renovada proclamación del Evangelio de Jesucristo, anunciándolo de modo que lo conozcan todas las personas, para que el amor misericordioso del Divino Salvador invada el corazón y la historia de su buena gente. El santo pueblo de Dios que peregrina en el Salvador tiene aún por delante una serie de difíciles tareas, sigue necesitando, como el resto del mundo, del anuncio evangelizador que le permita testimoniar, en la comunión de la única Iglesia de Cristo, la auténtica vida cristiana, que le ayude a favorecer la promoción y el desarrollo de una nación en busca de la verdadera justicia, la auténtica paz y la reconciliación de los corazones. Dopo aver finito di leggere il suo testo preparato, Francesco disse: “Vorrei aggiungere qualcosa che forse saltiamo sul martirio di monsignor Romero, che non era limitato al tempo della sua morte; si trattava di un martirio che è continuato dopo la sua morte”. Il martirio di Romero, “ha continuato, anche dai suoi fratelli nel sacerdozio e nel episcopato”, ha detto il papa, riferendosi alle critiche di Romero all'interno della chiesa. “Quante volte le persone che hanno dato la loro vita o che sono morti sono ancora lapidati con la pietra più dura al mondo: la lingua”, ha detto il Pontefice. Il papa aveva letto il discorso sommessamente, con tono monocorde, sembrava stanco, invece alla fine quando ha parlato liberamente è diventato vivace. L’udienza è iniziata con un saluto dell’attuale Arcivescovo di San Salvador, Mons. José Luis Escobar Alas, che ha presentato i 500 partecipanti, tra cui “maggior parte dei vescovi”. Escobar ha detto che il 23 maggio il papa ha scritto la pagina più bella della storia della Chiesa in ElSalvador e della storia del stesso paese. Ha espresso i suoi sentimenti di gioia e gratitudine per aver dato in Romero un intercessore e un modello. Ha parlato del superamento dell’ingiustizia sociale e del conflitto sociale grazie a Romero. Ha chiesto presto la canonizzazione di Romero e presto la beatificazione di Rutilio Grande. Ha “ribadito l’invito” al papa a visitare El Salvador che sarebbe “una grande benedizione” per il popolo salvadoregno e una grande gioia, mentre El Salvador soffre tanta violenza e dolore. Ha offerto a Francesco “obbedienza incondizionale”. Finalmente, ha invocato la intercessione di Romero per avere ogni grazia sul successore di Pietro e ha chiesto al papa la benedizione per El Salvador. “Siamo grati al Santo Padre, veniamo a ringraziare come comunità salvadoregna”, ha detto Mons. Gregorio Rosa Chavez, vescovo ausiliare di San Salvador—uno dei membri della delegazione—a Radio Vaticana. “Il mondo ha in Romero un’icona di ciò che la Chiesa sogna per i pastori, un pastore del gregge che va avanti, come dice il Papa, tra e dietro il gregge, un pastore che ha odore di pecore e dà la sua vita per il suo gregge”. Hanno dato il papa reliquie di Romero: uno scapolare e un pezzo del corporale macchhiato con il sangue di Romero. Francesco disse il sangue di Romero è mescolato con “il sangue di un gran numero di martiri cristiani, che anche oggi è ancora drammaticamente versato nel campo del mondo con la certa speranza che porterà frutto in un abbondante raccolto di santità, di giustizia, la riconciliazione e la l’amore di Dio”. Le reazioni ai commenti di Francesco seguono schemi prevedibili. La stampa in El Salvador ha riferito che Francesco aveva di mira i vescovi salvadoregni, che, fino a poco tempo, eranno divisi su Romero (uno eveva detto Giovanni Paolo II, che Romero è stato responsabile per le morti di guerra civile, presumibilmente fomentando conflitti di classe al denunciare l’ingiustizia) . L’Associated Press è apparso di visualizzare le osservazioni attraverso le divisioni del recente Sinodo dei Vescovi, riferendo che Francesco aveva “denunciato” funzionari clericali che si opponevano a Romero. In realtà, entrambe le viste sembravano mancare il bersaglio. Francesco non aveva intenzione di isolare i vescovi salvadoregni, perché ha segnalato di avere sentito personalmente le critiche ingiuste di Romero—in Argentina. Egli inoltre non ha direttamente “denunciato” o criticato nessuno, sottolineando che Romero è stato oggetto di ‘diffamazione’ come un attributo del suo martirio. “Cioè, è bello vederlo anche così”, disse Francesco di Romero: “come un uomo che continua a essere martire”. La delegazione salvadoregna comprende sette vescovi, e in representation del governo il ministro degli Esteri, Hugo Martinez, e il Ministro di Governo e delle Comunicazioni Hato Hasbún. Questi sono stati accompagnati da centinaia di salvadoregni che vivono in Italia, particolarmente nella città di Milano. I membri della delegazione hanno iniziato in fila per entrare nel Vaticano per il Portone di Bronzo di Piazza San Pietro alle ore 9.00 per l’udienza che ha avuto inizio a mezzogiorno nella Sala Regia del Palazzo Apostolico. Nel incontro, i vescovi salvadoregni hanno aggiornato il papa sullo stato della causa di beatificazione del martire gesuita salvadoregno Rutilio Grande. Secondo mons. Jesus Delgado Acevedo, vicino alla causa di canonizzazione di Romero, “Il Papa ha condizionato, in un certo senso, la canonizzazione di monsignor Romero” alla conclusione dei lavori nella causa di Grande per essere in grado di personalmente canonizzare Romero e beatificare Grande durante un singolo viaggio in El Salvador. “Ha detto ai Vescovi che il giorno in cui la beatificazione di Grande è completata, sarebbe conveniente anche canonizzare Romero, a condizione che un miracolo operato per l’intercessione di Romero è stato dimostrato”, Delgado ha detto a un giornale salvadoregno prima di partire per l’Italia. La Chiesa salvadoregna insiste sul fatto che tre possibili miracoli Romero sono stati già inviati a Roma, ma Delgado ha detto che non sapeva se sono stati presentati al papa. I salvadoregni hanno proposto il Papa andare in El Salvador a presiedere la doppia cerimonia di Romero e Grande durante il suo imminente viaggio in Messico, confermato dal Vaticano nel 2016. “Penso che, presumo, non sono un profeta”, ha detto Delgado, “che la visita del Papa potrebbe essere il prossimo anno, nel corso della sua visita in Messico, forse poteva allungare la sua visita in Guatemala e El Salvador, e potrebbe essere il momento in cui il Papa visita El Salvador e canonizza monsignor Romero”. I membri dei vescovi salvadoregni che hanno partecipato all’udienza includono il Vescovo Militare Mons. Fabio Colindres; ei Vescovi da: Chalatenango—Mons. Luis Morao Andreazza; San Vicente—Mons. José Elias Rauda Gutiérrez; Sonsonate—Mons. Constantino Barrera Morales; e Zacatecoluca—Mons. Elías Samuel Bolaños Avelar, che ha coordinato la composizione della delegazione. Ha inoltre partecipato il suddetto Mons. Delgado. Prima di incontrare con i salvadoregni, Papa Francesco ha avuto incontri separati con rappresentanti del CELAM, la Conferenza Episcopale Latinoamericana, e con il card. Gerhard Müller, Prefetto della Congregazione per la Dottrina della Fede, tra altri. Al di là delle guarigioni presentate per spianare la strada per la canonizzazione di Romero, Mons. Rosa Chavez ha detto che i pastori salvadoregne sperano in due miracoli in particolare: a livello locale, per una vera riconciliazione nel paese e per superare la violenza e a livello globale: che il Beato Romero può essere un’icona di ciò che Papa Francesco sogna come pastore, “una Chiesa povera per i poveri”. Il Palazzo Apostolico, sito dell'Udienza. What is mercy? Mercy is the most complete expression of love. Love is commitment, forgiveness, justice, and understanding other people. Mercy is not the pride of the Pharisees who despised the poor and those living on the margins of society, but the embrace of God, who though he was rich, came into this world to seek out the poor and those who did not want to sit down and eat with them. Mercy is goodness expressed in action and not simply in words. Mercy… each one of you understands this because I believe we have all performed some small act of mercy for others and above all, we have all been the object of mercy. If God had not been merciful to us when we fell into sin, where would we be? If God had not been merciful to us and forgiven us before he died, where would we go? Perhaps in our relationships with other people we have performed many acts of mercy or perhaps we have received great mercy from others. Blessed are those who have performed many merciful acts. This is what God desires! The mission of the Church is to proclaim the marvelous works of God’s mercy. This is her primary mission. But together with this there is another dimension: to call people to faith, to conversion and to mercy. And in the third place, to denounce sin that separates humanity from this relationship with God, from this relationship of faith and truth and mercy—to denounce all those realities that do not allow us to dispose ourselves toward God’s coming. Blessed Romero preached a final, masterful lesson on mercy which synthesizes everything described above. At his last Sunday sermon the day before he was martyred, Blessed Romero preached on the Gospel account of Christ and the Adulterous Woman (John 8:1-11). “I can find no more beautiful figure of Jesus restoring a person’s human dignity than that of the sinless Jesus who comes face to face with the woman surprised in the act of adultery,” said Romero. (March 23, 1980 Homily.) “Look at Jesus’ attitude,” Romero urges: “Strength but tenderness”—embrace the sinner, reject the sin. Despite the woman’s sinfulness, Christ sees that “converting the woman is better than stoning her; forgiving and saving her is better than condemning her. The law has to be at the service of human dignity and not focused on legal details that so often can trample people’s honor,” Romero adds. Inspired by this lesson, Romero goes on to plead on behalf of the peasants, “whose laments rise to heaven each day more tumultuously,” for the law in El Salvador not to be applied with arbitrariness and harshness, but for the army to “Stop the repression” of civilians, even if it meant disobeying orders to do so. Romero knew that saying this would put him in grave danger, but he was inspired to make this appeal by the message of the Gospel. As a result of this final act of mercy, Blessed Oscar Romero was martyred on the following day. For his Christian denunciations and calls to repentance, for his faithful preaching on mercy, and for his selfless emulation of the Good Shepherd who guides and protects his flock with his very own life, we propose Blessed Oscar Romero for the Holy Year of Mercy. “Those who have Archbishop Romero as a friend in the faith,” said Pope Francis in his letter for Blessed Romero’s beatification, “who invoke him as protector and intercessor [will] find in him strength and courage to build the Kingdom of God, and to commit to a more equitable and dignified social order,” premised on the virtue of Mercy. On the Feast of Saint John Paul II, the Pope of Divine Mercy.